Ebola in West Africa is a major crisis, and many Ohio University students, parents, faculty and staff have questions about the situation. We have created this site to provide information on the disease, the crisis, and efforts around the world to control the situation. You cannot get Ebola through the air. You cannot get Ebola through the water. You cannot get Ebola through food (except bushmeat). Touching the blood or the bodily fluids of a person who is sick from Ebola or has died from Ebola. Touching items such as needles that have been contaminated. Touching animals (or their body fluids) that have been infected with Ebola. A person with Ebola CANNOT spread the disease until the symptoms appear. Ebola is a severe, often fatal disease caused by the Ebola virus. Symptoms appear within 21 days of exposure. People exposed to Ebola are not contagious unless they have symptoms of Ebola. These symptoms include fever (higher than 100.4 F), headache, muscle pain, vomiting, diarrhea, stomach pain, unexplained bleeding or bruising. A person infected with Ebola cannot spread the disease until the symptoms appear. The main areas affected by Ebola are Guinea, Sierra Leone and Liberia in West Africa. The World Health Organization officially declared Senegal and Nigeria free of Ebola virus transmission on October 17th and 20th, respectively. The situation in Guinea, Sierra Leone and Liberia remains very serious. 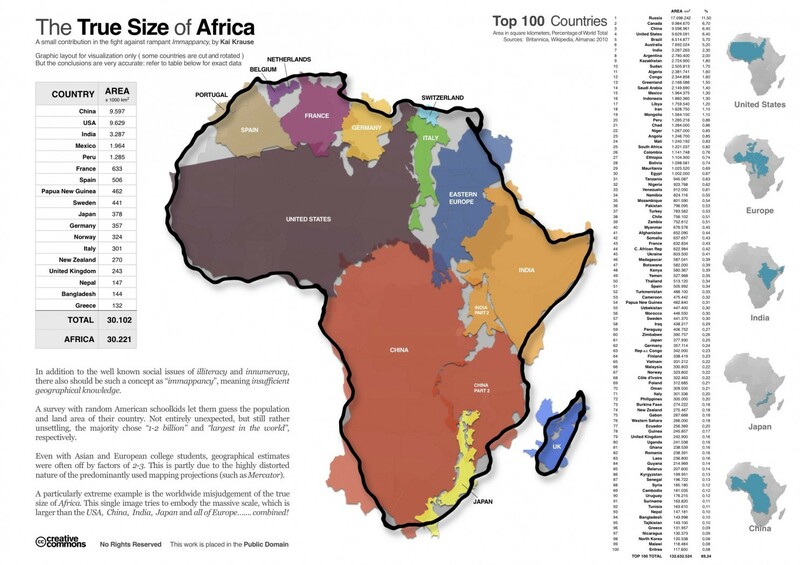 And here is a map by Kai Krause that provides more context on just how large Africa is. Many people do not realize it, but the continent is so large that the United States, China, India, Europe and Japan could all fit inside of Africa. Africa, the planet's 2nd largest continent and the second most-populous continent (after Asia) includes (54) individual countries, and Western Sahara, a member state of the African Union whose statehood is disputed by Morocco. Note that South Sudan is the continent's newest country. With a 2011 population of 1,032,532,974, it accounts for just over 14% of the world's human population. It also contains the Nile River system, the world's longest, and the massive Sahara Desert, the worlds largest. Africa is surrounded by the Mediterranean Sea to the north, both the Suez Canal and the Red Sea along the Sinai Peninsula to the northeast, the Indian Ocean to the east and southeast, and the Atlantic Ocean to the west. Major Languages : By most estimates, well over a thousand languages are spoken in Africa. Most are of African origin, though some are of European or Asian origin. Africa is the most multilingual continent in the world, and it is not rare for individuals to fluently speak not only multiple African languages, but one or more European ones as well. Africa is the second most populous continent, after Asia. OHIO students are not currently at any risk of contracting Ebola on the OHIO campus. OHIO has a plan in place to deal with Ebola, just as it has plans in place to deal with other diseases and possible emergency situations. OHIO is providing information on Ebola to OHIO students, faculty and staff, just as it provides information on other health warnings to students, faculty and staff as needed. OHIO students are much more likely to catch the flu than they are to catch Ebola. All Americans are encouraged by the CDC to get a seasonal flu vaccine each year. Students from several groups on campus have come together to form The Ebola Campaign. Currently, the campus organizations involved are the Global Leadership Center, the African Student Association, Global Studies, and English Language Improvement Program. These groups are working together to support Doctors Without Borders. The Ebola Campaign is expected to consist of various activities including educational events/ presentations, student/ community involvement, as well as fundraising events throughout this academic year. The organization is hoping to not only to raise support and awareness about this terrible pandemic, but also to provide aid to the international workers that have volunteered and put their lives on the line to help stop the spread of Ebola.